SEO professional around the globe need a high quality source for their promotion methods, such as , content creation, website building and link building to name a few. If the quality level is lacking Google will rank you accordingly. When looking for the right partner to fill all these needs, the task seems futile. However that does not mean it does not exist, when you find all of these needs can be met by just one company, you have found the right partner to push your business goals even further. What is HopInTop and Posirank? Are they what we seek? Variety and Quality of Backlinks - These qualities is what drives solid rankings. Ensuring you have high page rank on real websites and high domain authority links to guest posts. Results will be achieved. Training and Support- Posirank offers access to their strategy room, they have a host of downloadable PDF’s and guides and they offer weekly showcases of the products ,100% transparency. Solid menu of services and products - Posirank offers, content creation, lead gen website building and also high quality reporting. No additional Software- You do not receive client dashboards or set audits with Psoirank. They are not Flashy - They offer reports that are basic and to the point. If you need data to impress your clients and show what is being done, you won’t find it here. HopInTop has a highly qualified, experienced and passionate digital marketing team which delivers tangible results to its clients. They generate high quality tailored strategies for their clients based on their clients objectives and goals. HopInTop prides itself in delivering exceptional customer care to all of its clients and developing long lasting trustworthy relationships. HopInTop's offers over 50+ digital marketing solutions, they use the right mix and pairing of these services to yield the best results. 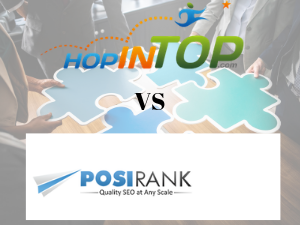 In writing about what is Posirank vs HopInTop it can be noted that HopInTop not only offers solutions they offer results.